Posh Meets Plunder In "Pirate Lives! The Musical!" In "Pirate Lives! The Musical!" Uppercrusters and swashbucklers cross swords as Flat Earth Theatre stages the world-premiere of "Pirate Lives! The Musical!" from April 20 - 28 at the Arsenal Center for the Arts, located at 321 Arsenal Street in Watertown. 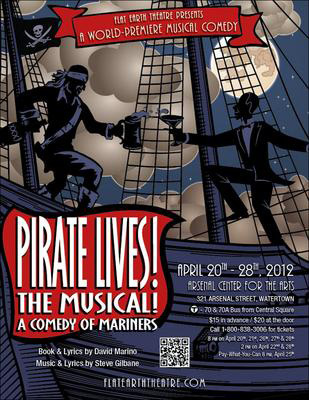 Written by Somerville playwright David Marino with composer Stephen Gilbane, "Pirate Lives!" pays crass homage to the works of Noel Coward with a tip of the hat to Gilbert and Sullivan. Marino will also direct the production. Cultures clash when Captain Jonathan Emerald Sherry dubiously enlists Britain's bourgeois as crewmen aboard his once-feared though unfortunately-named pirate ship, The Coward. While the captain fights tooth and nail to recapture his ship’s notoriety, havoc rages on deck as the novice cutthroats navigate otherworldly encounters, romantic entanglements and secret identities as they adapt to life on the high seas. With a pursuing foe drawing nearer, do the misfit buccaneers have what it takes to make The Coward brave again? The cast of "Pirate Lives!" features Brandon Rahhal, Catherine Lee Christie, Christine Toohey, Devon Jones, Eric Rehm, Jeffrey Marcus, Megan Goltermann, Monica Shea, Noah Tobin, Sophia Shrand and Stewart Holmes. David Marino has been performing, teaching, writing and directing with ImprovBoston since 1997 and is currently the Director of Production Development. He performed with ImprovBoston's Mainstage for 8 years, and directed the weekly competitive elimination shows "Micetro," "UnNatural Selection," as well as "Comedy in the Round" for five years. He conceived and directed many scripted and improvised shows, including "Archipelago," "Pirate Lives," "Groaners and Boners," "Continuum," "Center Mike," and "Agent Spy," which was showcased at the 2004 Chicago Improv Festival. "Code Duello," an improvised comedy about the fatal duel between Alexander Hamilton and Aaron Burr, continues to play to sell out performances at comedy festivals around the country. Stephen Gilbane has composed music (and produced cast recordings) for eight of ImprovBoston’s annual Halloween "Gorefest" scripted original musicals (including 2010’s "Cirque du Slaughté," available on iTunes). He has co-written several short musicals, including "The History Of Nails," "Romance 101" and "Hollywood Insider." He has also developed his full-length musical "Showstopper! A High-Tech Musical" with the Boston musical theater workshop NOMTI, of which he has been a member since 2003. He has composed music for several short films (including seven annual Boston 48-Hour Film Project films) and the full-length "Bit Parts." For tickets and information, call 800-838-3006 or visit flatearththeatre.com. Free parking is available directly adjacent to the theater.